Piggy was an adorable "pocket-size" Schemer daughter who never knew she was small. 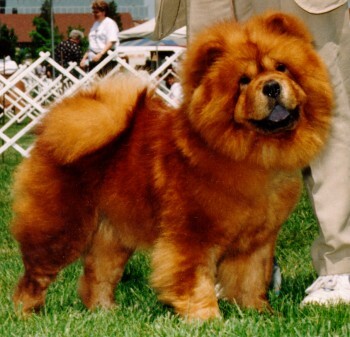 She was Best of Breed at the New York Specialty in 1997, an honor which was shared by her son Ch. Domino When Pigs Fly in 2001. Whenever you look at the Domino Chow Chows logo, that is Piggy on the right, next to her father Schemer and sharing the place of honor with her great-grandfather Tiger on the left. When we traveled with Piggy, she was always happy to spend the night right in bed with us - very unusual for a Chow, but she was a sweet girl that really loved her people.Her temperament has carried through in her offspring - her descendants are among the most loving and gentle of our Chows. Page Hits: 13,170 © 1997-2019 Domino Chow Chows, All Rights Reserved.